Green Cab VT owner Charlie Herrick addresses Burlington City Council members ahead of the vehicle-for-hire ordinance vote. There were signs Tuesday that the Burlington City Council debate about vehicles for hire would be a contentious one. The first came early in the afternoon, when Mayor Miro Weinberger circulated an annotated memo making his case for the new rules. The second came a moment before the debate Tuesday night when council president Jane Knodell handed her gavel to Councilor Kurt Wright, freeing herself to participate in — rather than moderate — the debate. The question at hand was whether the council should approve a new vehicle-for-hire ordinance that increases enforcement and, controversially, allows "transportation network companies" — such as the ride-hailing service Uber — to operate in the city. The council ultimately signed off on the new rules in a 9-3 vote. The main sticking point was whether companies should be able to conduct their own background checks — a role Uber has insisted on retaining. Weinberger argued that new rules included safeguards to make sure companies comply, by enabling periodic audits and requiring company officials to swear under oath that they're meeting the city standards. Unconvinced, Progressive Councilors Knodell and Max Tracy countered that the arrangement forced the city to "trust" Uber, while allowing it to maintain what Tracy called "opaque operating practices." Fellow Progressive Selene Colburn joined them in voting against the new ordinance. Weinberger, who has become a vocal advocate for Uber and Uber-like companies, made the case Tuesday night that its arrival has actually made the taxi industry safer — by providing additional late-night transportation options and by allowing passengers to rate drivers. He also suggested that allowing them to operate in the city would show that "Burlington is serious about embracing innovation." The public forum portion of the meeting consisted almost entirely of a procession of Uber drivers who, one after another, praised the opportunities afforded by the company. 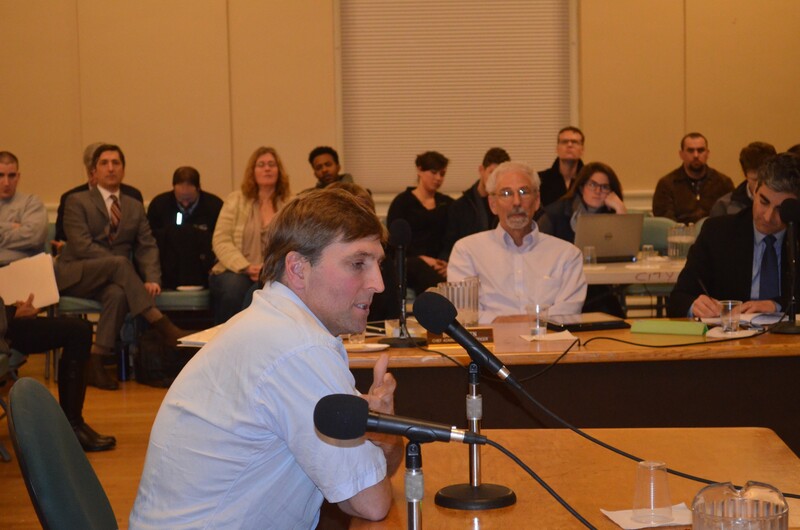 But the sharpest exchange of the night came when Green Cab VT owner Charlie Herrick called out the mayor for failing to look at him as he delivered his remarks to the council. Herrick, who has been the most active local opponent of Uber, disparaged the administration, suggesting that the new rules amount to deregulation of industry. “I’m taking notes,” the mayor said, in defense of his lack of eye contact. Weinberger, who was indeed writing, takes copious notes during most council meetings. Other points of interest in the new ordinance: It establishes a taxi enforcement officer, and it permits the controversial practice of surge pricing, pioneered by Uber, as long as prices are disclosed ahead of time.